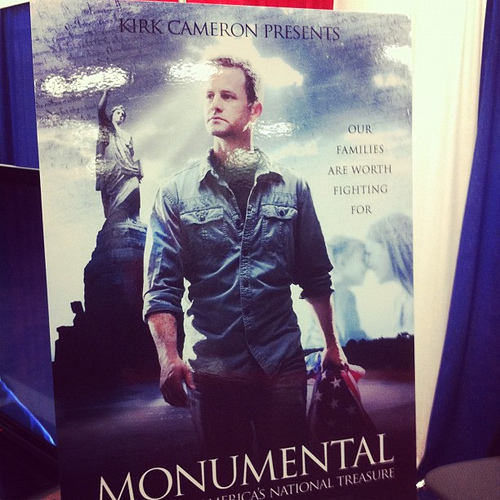 Sola Sisters: Concerns About Kirk Cameron's Movie "Monumental"
Former teen actor Kirk Cameron, who famously converted to Christianity a number of years ago, has had an interesting Christian walk, to say the least. Almost 10 years ago, after hearing a sermon by evangelist Ray Comfort that rocked his world, Cameron contacted Comfort to discuss Comfort's powerful sermon, and the two subsequently became friends. Eventually, Cameron and Comfort joined forces with Todd Friel, a former stand-up comedian, also turned born again Christian, and the three began to work together on a satellite radio program called Way of the Master (also known as WOTM, and so named after the witnessing method Comfort had used so powerfully in the sermon that had caught Kirk Cameron's attention). This Christian ministry rapidly grew in popularity, and featured street witnessing segments using the Way of Master method to stir the consciences of lost sinners. Eventually, Way of the Master split into two distinct separate ministries: Way of the Master (Kirk Cameron and Ray Comfort) and Wretched Radio/TV(Todd Friel), even though all of these men continued to work together doing conferences. Kirk Cameron also starred in the 2008 movie Fireproof, a movie that became wildly popular in the Christian community, and which had at its core a very strong and biblical gospel message. So it should come as no surprise that Cameron has come to be known in the last decade for his strong stance on biblical truth and his devotion to the purity of the gospel message. To say that there is tremendous goodwill toward him in the Christian community would be an understatement. Having said all that, Cameron's latest movie, Monumental, has proved to be a monumental letdown, in that it apparently does not give a clear gospel message. The movie, which has been promoted by Wretched, also contains factual inaccuracies as well as conflicting messages as a result of Kirk's close association with Mormon Glenn Beck and Reconstructionist David Barton. During the live feed at the premier of the movie, right before showing the film, Cameron introduces Glenn Beck, calling him "one of our biggest supporters of the film and a friend." Rather concerning, given that Glenn Beck is a very outspoken Mormon (with New Age tendencies, no less), and Kirk's close friend Todd Friel is well aware of this. In fact, Todd has exposed Beck's beliefs a number of times (see below), and yet until recently, the Wretched Facebook wall was heavily promoting this movie. Since the opening of the movie last night, a number of articles have already been written: John Chisham of Wittenburg Church Door weighs in here, Jon Speed, blogger at The Informed Evangelist, weighs in here, authors Vince and Lori Williams weigh in here, and Dr. Warren Throckmorton weighs in here. I want to state for the record that I have myself benefited tremendously from the Wretched/WOTM radio program (of which Kirk was a founding member), and it was there that I was first introduced to excellent Bible teaching from John MacArthur, Bob DeWaay, Phil Johnson, R.C. Sproul, Mark Dever, Al Mohler, Dan Phillips, Mike Gendron, Ken Ham, etc. It was through such wonderful, biblical, balanced teaching that my own thinking became, by God's grace, more and more aligned with God's word. I thank God for Wretched/WOTM and how those programs helped me grow in discernment. Host Todd Friel has a masterful way of using his humor and his intellect to make his points. So I will close this post by pointing out that Wretched Radio has a highly discerning audience. Todd Friel has taught his listeners and viewers extremely well when it comes to training them in discernment. In an eight minute clip from Wretched TV (August 2011) that can be viewed below, you can watch as Friel dismantles Glenn Beck and his New Age/Mormon beliefs. I therefore cannot imagine that a moralistic movie with no gospel message, even starring someone as well-liked and well-intended as Cameron appears to be, is going to get past the radar of most Wretched followers......especially when it has been enthusiastically endorsed by a New Age Mormon. But we'll have to see how this all plays out, won't we? We're living in curious times. Glenn Beck's "Three Paths to God"?